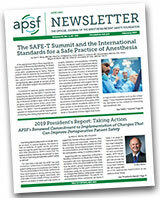 DEADLINE EXTENSION (August, 31) – The APSF Committee on Education and Training, under the direction of APSF leadership, announces the third annual and expanded APSF Trainee Quality Improvement Program. The 2018 program hosts tracts for resident physician anesthesiologists, student registered nurse anesthetists and anesthesiologist assistant graduate students. APSF invites all US and Canadian anesthesia professions in training to demonstrate their program’s work in patient safety and QI initiatives. The top two projects in each tract will receive APSF recognition and financial rewards. Anesthesiologist assistant graduate students is August 31, 2018 at 11:59 pm.